The late Ms. Margaret Ann “Ranny” Riecker was the longtime president and CEO of the Herbert H. and Grace A. Dow Foundation and a trustee of the Towsley Foundation. She was one of the original volunteer board members of the Council of Michigan Foundations, representing the private family foundations. 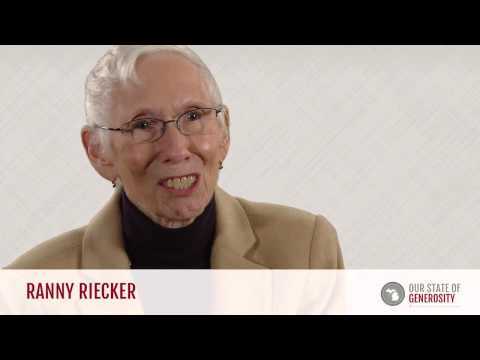 Ms. Riecker was the first chair of the Leadership Advisory Committee for the Dorothy A. Johnson Center for Philanthropy, and also served in multiple critical volunteer policy roles across the state over several decades. Ms. Riecker was the first, and so far only, person to have served twice as the chair of the board of the Council of Michigan Foundations. Ms. Riecker had a particular interest and expertise in developing public policy supportive of private philanthropy. 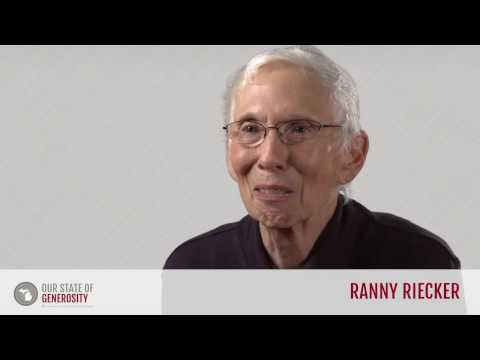 Ms. Ranny Riecker talks about her career in philanthropy. Ms. Ranny Riecker talks about how the Council of Michigan Foundations engaged in public policy and lobbying to save the life of the philanthropic sector. Ms. Ranny Riecker talks about Michigan's unique and effective approach to public policy through initiatives like RAGS on the Hill. 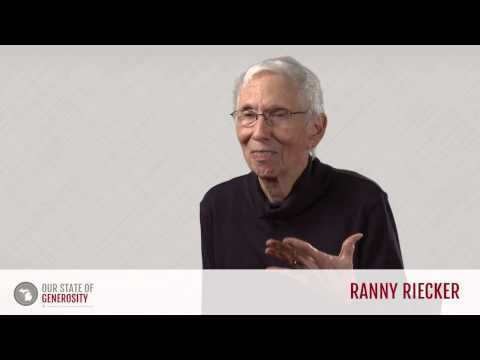 Ms. Ranny Riecker talks about the remarkable leadership of Russ Mawby. Ms. Ranny Riecker talks about the importance of being a good listener and not imposing your own methods on local leaders. Ms. Ranny Riecker talks about how public policy initiatives need to be informed by legitimate research and data in order to be truly effective. Ms. Ranny Riecker talks about how the Council of Michigan Foundations (CMF) worked effectively toward change by focusing on a clear mission. Ms. Ranny Riecker provides advice on how to prepare for a visit with a legislator. Ms. Ranny Riecker talks about how foundation leaders need both collaboration and education to effectively implement their missions. Ms. Ranny Riecker talks about the Tax Reform Act of 1969 and its effect on foundations. 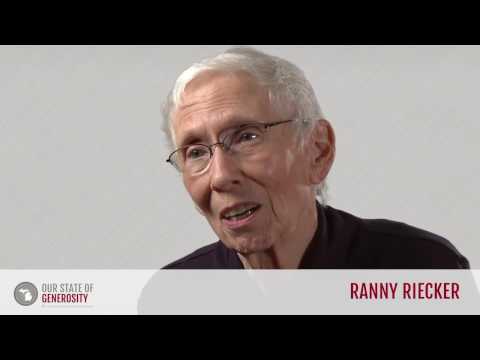 Ms. Ranny Riecker talks about the initial meetings that would create the Council of Michigan Foundations, in response to the Tax Reform Act of 1969. Ms. Ranny Riecker talks about why the Council of Michigan Foundations (CMF) became involved with public policy. Ms. Ranny Riecker talks about how the Michigan Tax Credit encouraged more people to give back to their communities. Ms. Ranny Riecker talks about how useful the resources provided by the Johnson Center for Philanthropy were for her foundation. Ms. Ranny Riecker received her Bachelor of the Arts degree in zoology from Carleton College in Minnesota. She then attended Mount Holyoke College in Massachusetts for her graduate education. Ms. Riecker grew up in Ann Arbor, Michigan. She was eight years old when World War II broke out, and her father left as part of a medical unit that was put together by the University of Michigan. 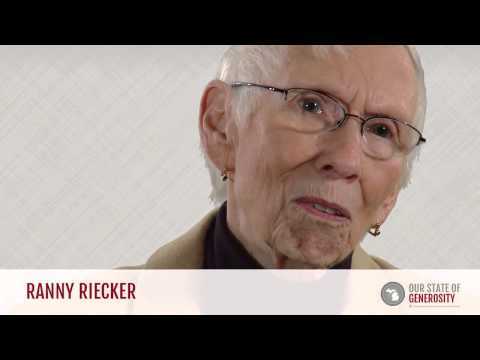 Ms. Riecker’s mother played a central role in teaching her the value of philanthropy through action, and insisted that one third of any earnings went to their church, and another third was invested in the Dow Chemical Company, which was founded by Ms. Riecker’s grandfather. Ms. Riecker left Mount Holyoke College to be with her husband, who had joined the Army and was stationed at the Pentagon. Upon leaving the Army, Ms. Riecker and her husband moved to Midland, Michigan, where they became involved in the election campaign of a Michigan state senator. Her involvement with this campaign gave her a crash course education in fundraising, political organizations, and leadership. In 1965, Ms. Elly Peterson became the chairwoman of the Michigan Republican Party, and she asked Ms. Riecker to replace her as vice chair to focus on the party women and the women’s club. This position centered on training and empowering female leaders in the party, and encouraging them to run for party offices. As Ms. Riecker said in her interview with Kathy Agard, “The law gave them the office but it didn’t empower them. They really needed to learn how.” Ms. Peterson later encouraged her to run for the position of Republican National Committeewoman, to which she was successfully elected. Ms. Riecker’s mother founded the Harry A. & Margaret D. Towsley Foundation in 1959, and Ms. Riecker and her sisters became trustees in 1962. She later acted as the foundation’s president from 1985 to 1999, when she also assumed the position of board chair(1). Ms. Riecker became a board member of the Herbert H. and Grace A. Dow Foundation (which had been founded by her grandmother, Grace A. Dow) in 1963. She served on the board for 51 years, and she served as president of the foundation for 13 years, from 2000 to 2013(2). By the end of 2013, the foundation had over $400 million in assets. 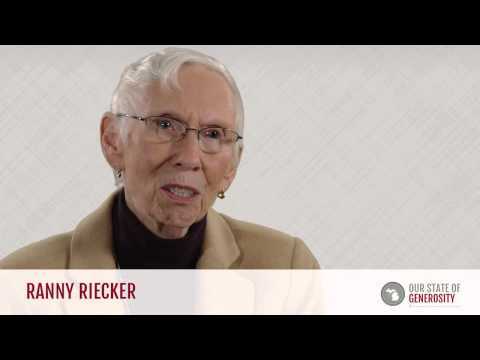 With her experience in politics and with family foundations, Ms. Riecker quickly became influential across Michigan, and was involved with two of the state’s infrastructure organizations, the Dorothy A. Johnson Center for Philanthropy and the Council of Michigan Foundations (CMF). 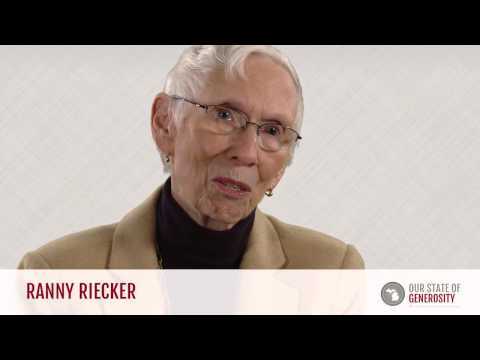 Ms. Riecker began her involvement with CMF in the early 1970s as a co-founder, and used her political background to engross herself in the public policy aspects of the organization. She was a trustee from 1974 until 2002, and served as chair of the board from 1982 to 1984, and again from 1999 to 2000. Additionally, Ms. Riecker was a longtime chair of CMF’s government relations committee(4). Ms. Riecker was involved with the Johnson Center through a variety of positions. Most significantly, she was the first chair of the Johnson Center’s Leadership Advisory Council, a volunteer advisory board. In 2005, Ms. Riecker co-chaired the first endowment campaign for the Johnson Center. The Herbert H. and Grace A. Dow Foundation gave a leadership-level gift reflecting her commitment to professional development and education in philanthropy. In recognition, the Johnson Center named its nonprofit services division, “Herbert H. and Grace A. Dow Nonprofit Services”(5). Outside of Michigan, Ms. Riecker was also involved with the Council on Foundations, a nationwide philanthropic infrastructure group. She held the position of trustee from 1992 until 1996, and offered her expertise by chairing its legislative and regulation committee from 1992 to 1995(1). Much of Ms. Riecker’s time was spent furthering and supporting higher education throughout Michigan and also at her alma mater, Carleton College in Minnesota. She was a member of Central Michigan University’s board of trustees for 18 years, acting as chair in 1976, 1983, and from 1989 to 1992(5). 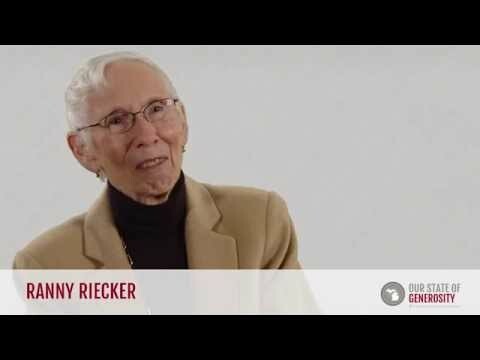 Ms. Riecker also served as board member, longtime supporter, and benefactor to the Gerald R. Ford School of Public Policy at the University of Michigan. Leading investments from both the Dow Foundation and the Towsley Foundation were made to the Ford School, in addition to her personal finances, to establish fellowships and scholarships for promising students of the program(6). At Carleton College, Ms. Riecker was an active board member from 1987 to 2010, and was chair of the board from 1999 to 2004(7). Throughout her career, Ms. Riecker was presented honorary doctorate degrees from Albion College, Central Michigan University, Ferris State University, Kalamazoo College, University of Michigan, Carleton College, Northwood University, and Michigan State University(2). Ms. Riecker’s commitment to bettering the mid-Michigan community is almost unrivaled, and she was involved with a vast number of local nonprofits either by serving as a board member or through active grantmaking. Ms. Riecker passed away on April 7, 2014 at the age of 80. Ms. Riecker was interviewed regarding her insights and experiences in working with Michigan’s philanthropic community and the Our State of Generosity (OSoG) partners. The following are selected quotations from her interview specifically related to the five organizing themes of the OSoG project. 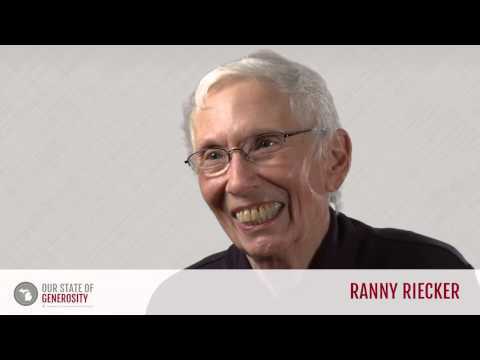 (5) “CMU Loses ‘Tremendous Friend’ with Passing of Margaret ‘Ranny’ Riecker.” Central Michigan University. n.d. Web. 18 August 2014.